An upcoming Tesla Roadster will literally hover off the ground using SpaceX thrusters — at least according to a tweet from CEO Elon Musk, who is known for sometimes-erratic behavior on social media. Celebrity YouTuber Marques Brownlee asked on Twitter whether Musk was joking. We’ve actually heard about Tesla’s plans to add thrusters to the Roadster before. The idea surfaced in June of last year, when Elon Musk assured interested buyers that the idea was very real, and that Tesla was serious about adding it. So besides purportedly hovering in mid-air, what’s the point of a sophisticated rocket-science thruster system replacing the back seats of a supercar? Rocket thrusters containing ultra high-pressure air could add a ton of forward thrust to the already peppy Roadster. The “SpaceX package,” as Musk refers to it, could draw energy from the massive 200 kWh battery pack as well. It might add substantial weight if it were to replace the backseats. And you wouldn’t be able to lug your kids around in it. At face value, the idea of a hovering Tesla is outrageous. Fred Lambert, a close Tesla watcher at Electrek, provided a reality check. It’s also worth noting that Musk often makes predictions and promises about the future, and they’re not always accurate. Remember that underwhelming tunnel the Boring Company dug last year? And that’s without getting into possibly insurmountable regulatory hurdles. The National Highway Traffic Safety Administration would likely raise concerns, for one — though it has approved a road-legal flying car in the past. There are also lots of aircraft laws enforced by the Federal Aviation Administration. And those could certainly apply to this thruster-Tesla. 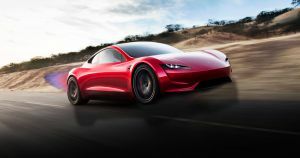 The more likely explanation: Tesla is considering thrusters, but just to give the Roadster’s acceleration an additional edge, not to literally hover. And even if they did build a proof of concept, it’s hard to imagine the vehicle going to mass market — maybe it’ll be a limited edition, like the Boring Company’s flamethrower. And then there are the limitations of the human body: “you can basically accelerate at the limit of human endurance,” Musk said of the plan on Twitter. There’s good reason to be skeptical of Musk’s plans for the Roadster. But then again, he managed to send one to space.